There are 33 candidates in the fray for the twin constituencies, including 24 for Jammu LS seat and nine for Baramulla Lok Sabha seat. Jammu and Kashmir on Thursday recorded an overall turnout of over 57 per cent in the Jammu and Baramulla constituencies in the first phase of the Lok Sabha elections, even as there were protests over defective EVMs in some areas. The two constituencies house an electorate of over 33 lakh, recording a voter turnout of 57.31 per cent, officials said. Addressing media persons at a press conference in Jammu, Chief Electoral Officer (CEO), Jammu and Kashmir, Shailendra Kumar said Jammu Parliamentary Constituency, spread across four districts of Jammu, Samba, Rajouri and Poonch with 20 assembly segments, recorded voter turnout of 72.16 per cent. The voter turnout was highest in Samba district at 75.07 per cent followed by 74.50 per cent in Jammu district, while twin border districts of Poonch and Rajouri recorded 70.40 per cent and 65.70 per cent respectively, the state CEO said. 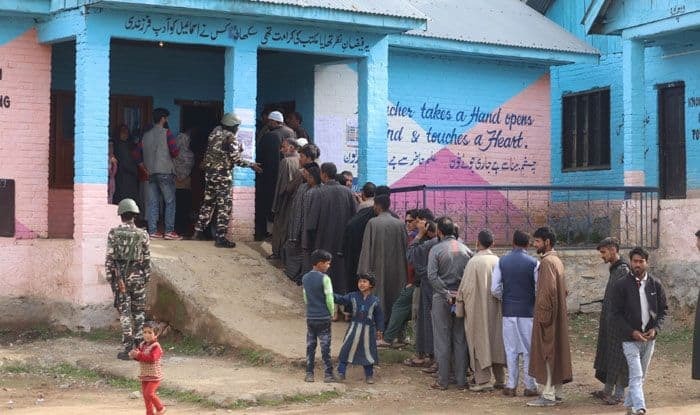 Baramulla Parliamentary Constituency, comprising three districts of Kupwara, Baramulla and Bandipora with 15 assembly segments, recorded 34.61 per cent polling with highest turnout of 51.7 per cent in Kupwara district, the CEO said adding Sopore segment recorded lowest polling. He said there are 33 candidates in the fray for the twin constituencies, including 24 for Jammu LS seat and nine for Baramulla Lok Sabha seat. He said the polling was held under the supervision of 12 general observers, eight expenditure observers and seven police observers, besides 462 micro-observers, while 7,692 staffers were deployed across 4,489 polling stations in the two constituencies. The two parliamentary constituencies have over 33 lakh voters, 17.16 lakh male, 16.80 lakh female, Kumar said. The CEO complimented voters, political parties, candidates, polling staff and security forces for smooth and peaceful conduct of the polls in phase I. He said the lone incident of shooting at Palhalan in Baramulla was being looked into. When asked about reports of malfunctioning EVMs, the official said the commission has rectified all of them. Congress candidate from Jammu, Raman Bhalla, who cast his vote in Jammu, had alleged large-scale malfunctioning of EVMs in Poonch and Mendhar belt of the constituency. He said people protested over the issue. Another Congress spokesman had claimed that in the EVMs, button number four (Congress) was not functioning and complaints were lodged with poll officials. Former minister and senior Congress leader Shabir Khan had told reporters in Rajouri, during the day, that defective EVMs had been sent to remote and rural areas of Rajouri and Poonch. But nothing has been done to repair the machines, he had alleged. While polling was underway, the National Conference and the PDP had alleged that uniformed personnel “coerced” people to vote for the BJP. “A voter at polling booth in Jammu was manhandled by the BSF because he refused to cast his vote for the BJP. Using armed forces at polling stations to coerce people to vote for the BJP shows their desperation and hunger to usurp power by hook or crook,” she said in her tweet. He, however, counselled politicians to verify facts before putting them in public domain as he said BSF personnel were not involved in beating people. Polling began amid tight security at 7.00 am in the Jammu constituency, with voters in Samba, Jammu, Rajouri and Poonch turning out early morning to exercise their franchise, officials said. In Rajouri and Poonch border districts, people along the Line of Control came out in large numbers to exercise their franchise, officials said. The Jammu Parliamentary Constituency has the highest number of 24 candidates among all the seats in the state. The constituency was won by the BJP’s Jugal Kishore in the 2014 General Elections. He defeated veteran Congress leader and two-time MP Madan Lal Sharma by a margin of over 2.57 lakh votes. Kishore is facing a tough contest this time as the National Conference has extended support to the Congress candidate and former minister Raman Bhalla, while the PDP has decided not to field any candidate from the Jammu region to ensure “opposition votes” are not split. The Jammu Parliamentary seat has the most voters at 20.05 lakh, including 9,64,834 women and 20 transgenders, in the state, officials said, adding that 2,740 polling stations, including dozens near the LoC and the International Border (IB), were set up for the polls.